What’s better than going out with good friends while enjoying decadent food and wine, delicious drinks, and great entertainment? Now, everyone knows that Florida has its share of noteworthy attractions year-round. But this Miami food and wine festival is a Fall event that’s been on my bucket list for a couple years. After all, I can’t think of a better way to spend my time in South Beach than dining on gourmet seafood dishes paired with the perfect wines. Or, walking around on the sand with a Jack and Coke in one hand, and a lobster cone in another (yes, that is a thing!). Honestly, it really didn’t matter what I was drinking or eating because it’s all incredible (not to mention, the weather in Miami is amazing in October). Let me just dive into the details about this experience that is made especially for “seafoodies”! What’s so great about this South Florida food and wine festival? Apart from the obvious sunshine and sand, there really are too many things to count. 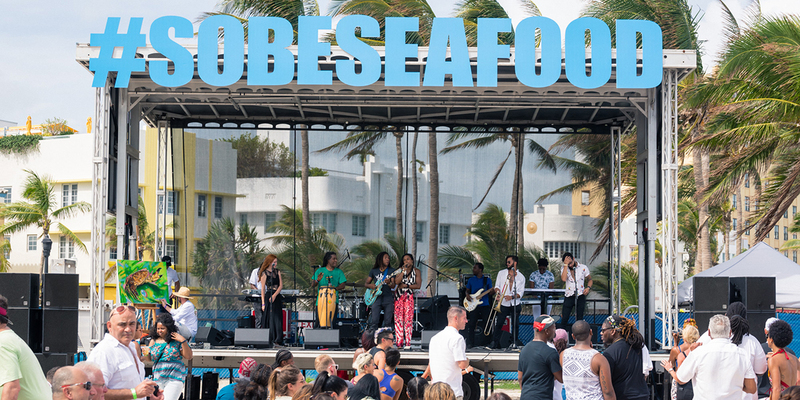 The South Beach Seafood Fest isn’t just a one-day or a one-weekend celebration. Your food tasting experience actually kicks off on a Tuesday night and ends on Saturday with an all-day party directly on the beach. In between, each night is a different event—featuring all the fresh seafood Miami is known for. And don’t forget that with a food and wine festival comes an abundance of wine, and SoBe Seafood Week has the best sips. I enjoyed some of the top wine selections (and most unique cocktails), always perfectly paired with whatever dish I was chowing down on. Here’s my play-by-play for the entire week of delicious-ness. On Tuesday, we kicked things off at a once-in-a-lifetime dinner party event at SoBe Seafood Week: An Evening at Joe’s. Only ONE of the food and wine festivals in Florida can host such an extravagant and intimate evening, and this is it. Held in Joe’s Stone Crab’s original setting “Jesse’s Room”, where Al Capone and Frank Sinatra once dined, this was an unbelievable experience. An Evening at Joe’s is an incredibly exclusive event for only 50 guests featuring fine wines, top-shelf cocktails, and an exquisite meal. Honestly, if you’re looking for a chance to meet a Food Network star and a James Beard Award nominee, here’s your chance. Chef Andre Bienvenu is one of the best chefs in the business. He creates a truly tantalizing meal with the freshest seafood alongside perfect wine pairings. Although it’s an incredibly exclusive event, the atmosphere was warm and inviting…it was well worth the splurge! This is a food and wine festival night that you WILL brag about. 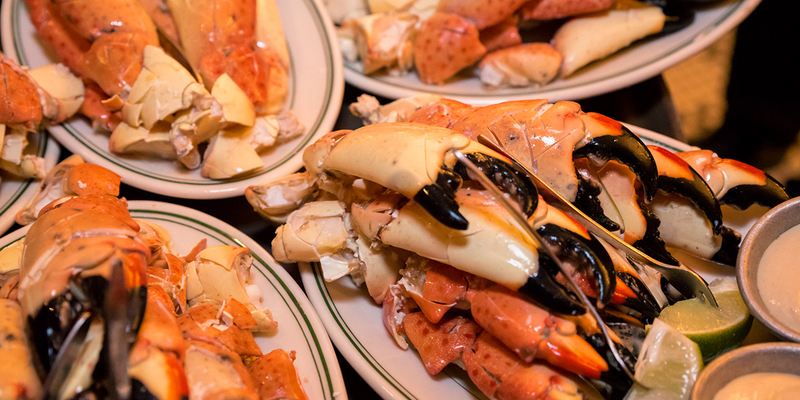 Bonus: this event coincides with the start of stone crab season and we tried the freshest catch of the year! On Wednesday, I crossed the next event off of my “Food Festival in Florida” checklist and headed on over to the Meat Market Miami for Cooking and Cocktails with my date! I absolutely loved the intimate evening of food and drinks put together by Celebrity Chef Fernando Desa, the Executive Chef of Goya, and Chef Sean Brasel, the Executive Chef of Meat Market. No joke: it was one of the most self-indulgent nights of eating and drinking that I’ve ever enjoyed. This was a six-course dining experience providing a whole new twist on traditional seafood dishes. We couldn’t get enough of the lobster and crab empanadas. And, don’t even get me started on the pan-seared sea bass. I was actually in a food coma after the fourth course but couldn’t stop myself from eating it all. And let’s talk about the cocktails…whoa! You may not expect a food and wine festival to teach you to make a mean margarita. 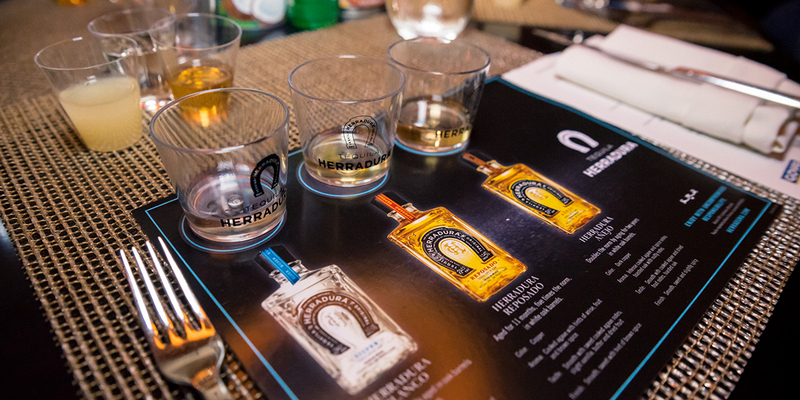 But by the end of the night, I’d tried Herradura tequila with some very unique flavor profiles, and dubbed myself somewhat of a budding mixologist. Again, this ticket is also all-inclusive VIP and it came with a gift bag! Thursday’s festivities included plenty of Crabs, Slabs, & Cabs at The Shelborne Hotel’s VIP Beachfront Garden. First of all, I love the name. I’m always down for succulent, sweet crab and tender slabs of meat paired with world-renowned cabernets. I mean, who wouldn’t enjoy that? This was a casual yet chic culinary experience under the stars that I’ll never forget. You start this night out with fresh cocktails by the pool bar before being escorted to the private, perfectly exclusive VIP Garden. Set up along the perimeter of this magical space are three of the top chefs in the business cooking up a storm: Chef James Versfelt, the Executive Chef at The Shelborne Hotel, Chef Bernie Matz, the Director of Menin Hospitality’s Culinary Program, and Chef Carlos Pimentel of the Mondrian. Each chef prepared their version of a crab and slab dish – YUM! Unlike other food festivals in Florida, these events aren’t doing bite-sized anything. We were indulging on Alaskan king crab, Wagyu beef, jumbo lump crab cakes, short rib and crab tacos, and endless sides from Goya. Each course was served alongside some of the best Cabernet Sauvignons I’ve ever tasted. You end the night with a selection of to-die-for desserts and pastries. If you can eat another bite after this night, I’m beyond impressed. Best part: everything is included the cost of the ticket! 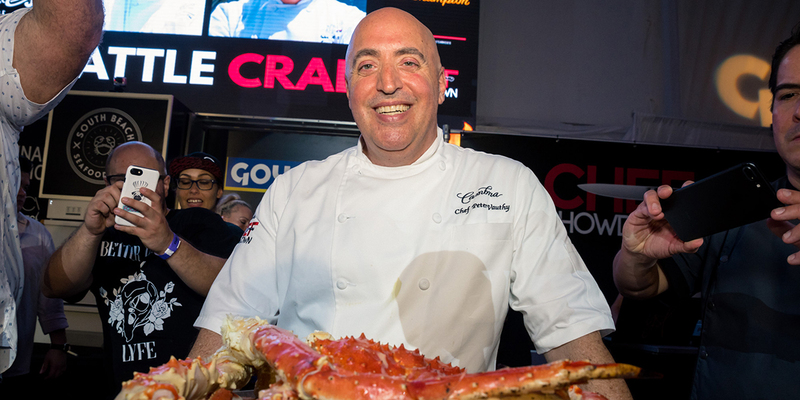 Hands down, the most sought-after all-inclusive Miami food and wine festival tickets are for the Chef Showdown, an epic night of competitive cooking. And there’s a reason for this. 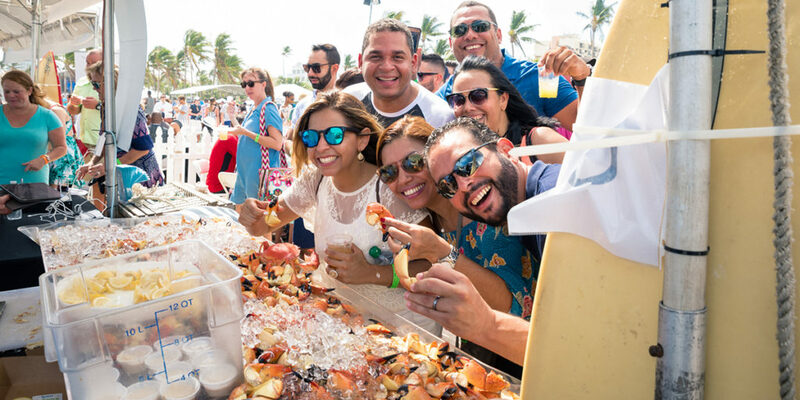 Held on Friday at Lummus Park in Miami, the beachfront battle brings in top executive chefs in South Florida to create some of the most marvelous cuisines you’ve ever seen or tasted. My favorite part: you get to be the judge! You’ll be astounded by what each chef comes up with. Choosing my favorite dishes was so difficult, second only to fitting that much amazing food and drink in my belly! There is so much energy at this event, it’s like being live on the set of MasterChef. Can I just say…Miami Beach events are killer. Where else would you rather party than under the sun on the gorgeous sands of Miami beach? And that’s why Saturday’s all-day food and wine festival is the perfect end to #SobeSeafood Week. The vibe on Saturday is amazing. Everything kicks off at high noon and goes until 7pm—unless you have a VIP pass and then the party keeps going for another couple hours. Either way, it’s still an entire day of fun, spanning five beachfront blocks. From the moment our group walked into the event, we were surrounded by incredible seafood and a constantly flowing open bar. 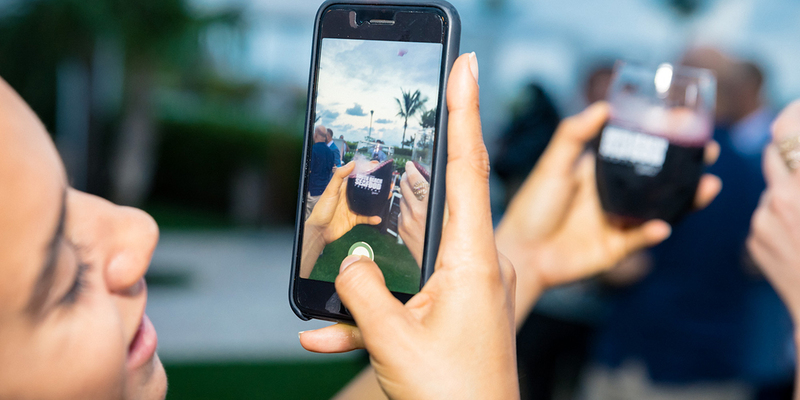 There are pop-up cafés everywhere featuring some of the best Miami restaurants including Cibo, Naked Taco, the Rusty Pelican…the list goes on. I loved that we could pick and choose dishes throughout the day—and they were cheap! Like I said before, these aren’t one-bite tastes. The portions are shareable (think large appetizer) and the most expensive one I got was two HUGE, fresh stone crab claws for $8 – can you believe that? I definitely paced myself but got stuffed on ahi tuna tacos, the famous lobster cone, mixed seafood ceviche, crab cake sliders…and a bunch of shrimp cocktail. Don’t judge me. As for the drinks, this food and wine festival included top shelf open bar for everyone (over 21, of course). Yep, you read that right! Enjoy everything from a tall glass of Chardonnay to ice-cold cocktails to beers galore. There’s a never-ending supply of drinks to enjoy responsibly. Nonetheless, I made sure to grab water every so often to stay hydrated during the marathon of eating, drinking, and dancing under the sun. Speaking of dancing, there’s the entertainment (I counted three big stages). The music featured big name bands and DJs that keep the beats pumping all day long. I decided that dancing would count for my workout for the day so I could keep on eating and drinking allllll day. If I had to categorize the dress code, it’s primarily South Beach Chic. I highly recommend flats, but feel free to wear whatever is most comfortable, given you’ll be eating and walking a TON. After an entire week of seafood smorgasbord, I definitely got a little spoiled. Okay, a lot spoiled. 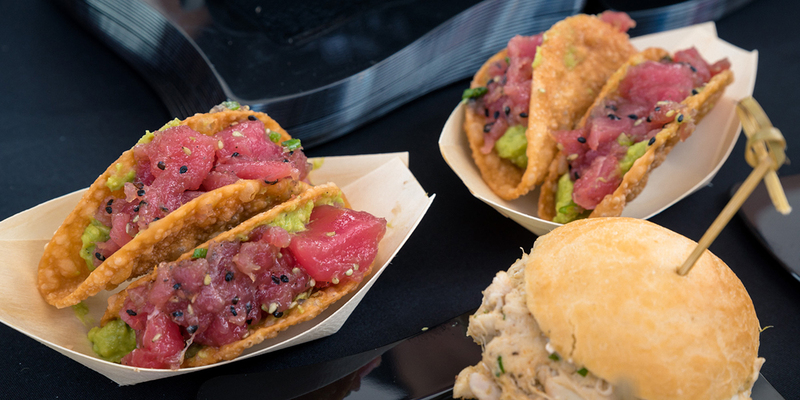 South Beach Seafood Week is hands-down the best food and wine festival Miami has to offer. Make it your must-go-to event if you are looking for things to do in October in Florida, or for a unique travel getaway. Don’t believe me? 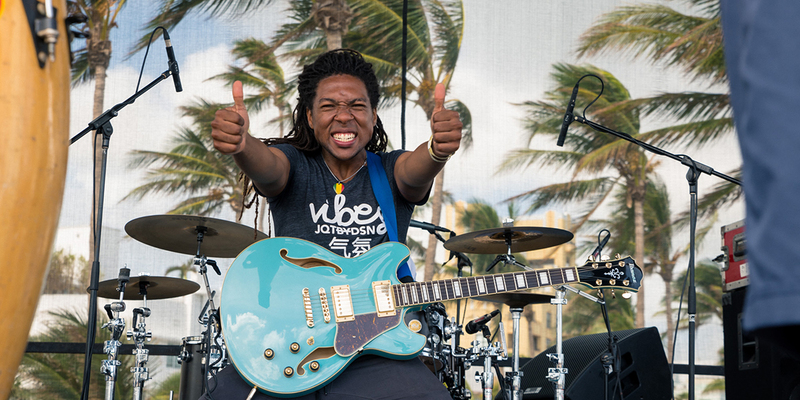 Take a peek at a few festival highlights from last year. FYI—tickets are already available for the 2018 food and wine festival, and they sell out quickly. My advice: don’t wait on getting the chance to eat your way through all of Florida’s best seafood!